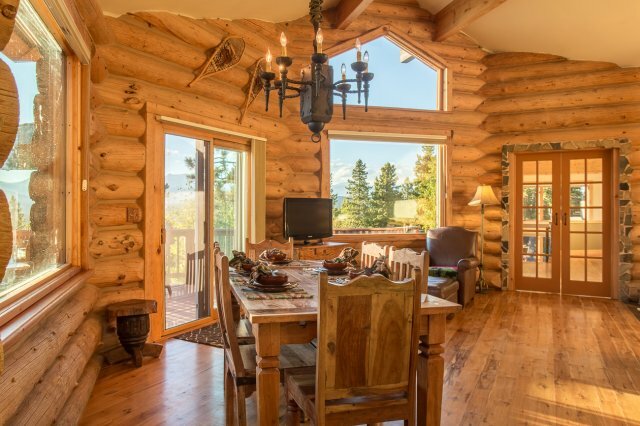 "TWO" story Master Bedroom Suite featuring a wall of windows to wake up to the most unbelievable views of the Rocky Mountains. 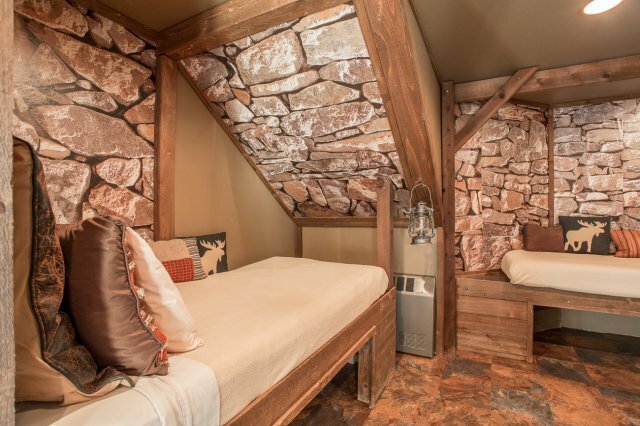 King sized bed is made from wine barrels with a top of the line Tempurpedic mattress, flat screen TV, walk-in closet & in suite master bathroom. 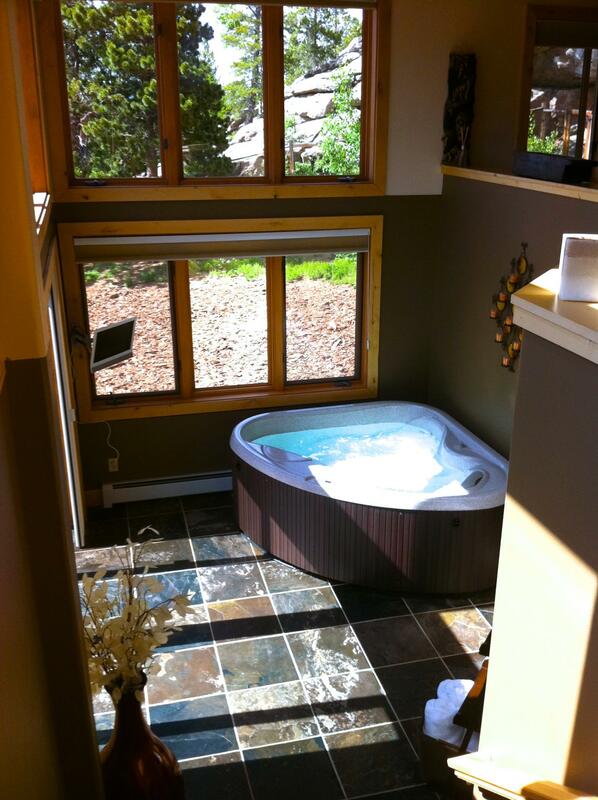 A 2 person Hot Tub is on the lower floor of the Master Bedroom and features many windows to take in the amazing views. There's another flat screen TV to watch as you relax while the jets work on your muscles. The 2nd master suite features a Queen Size Brass Bed with Walk in Closest, On suite bath, and flat screen tv and DVD player. 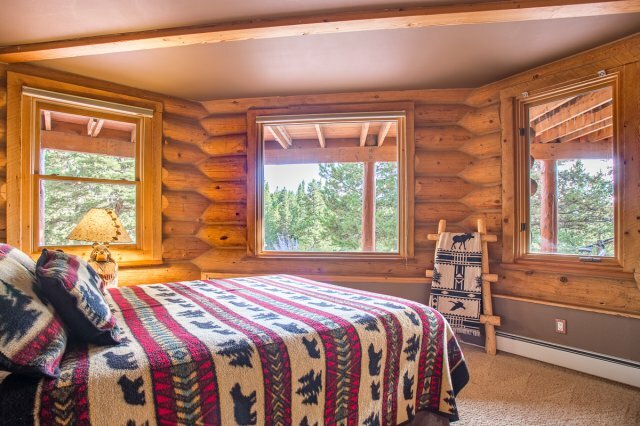 Our Bear's Den Guest Bedroom is cozy and features a Queen Sized Bed with fabulous Forest views. 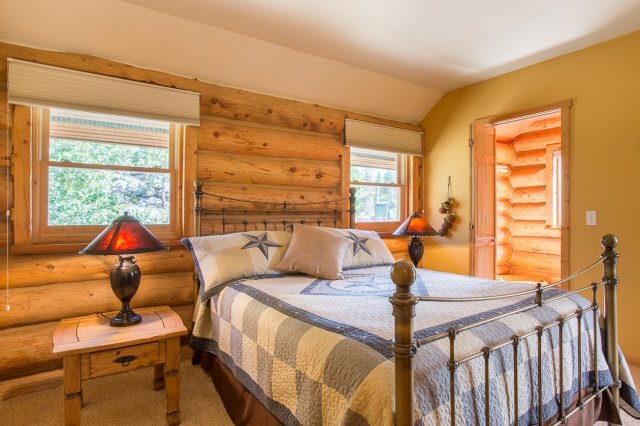 This guest room is nicknamed the Fishing Retreat because it's all by itself within the lodge and has a fish motif. This one is for early risers as the sun comes up on this side of the lodge. We are in Gold Mining country, so we created a Gold Mine inspired sleeping accomodation. This nook sleeps 2 full sized adults or two children in 2 twins. The cubbies underneath are great for sliding your suitcase in and out of your way. Up a spiral staircase, a Bunk Room Loft on the top most floor awaits tired kids or adults with 2 twins and 1 King sized floor mattress (not pictured). Weight limit for each of the twins is 175lbs. Flagstone patio picnic table seats 12. There's also a bench close by. 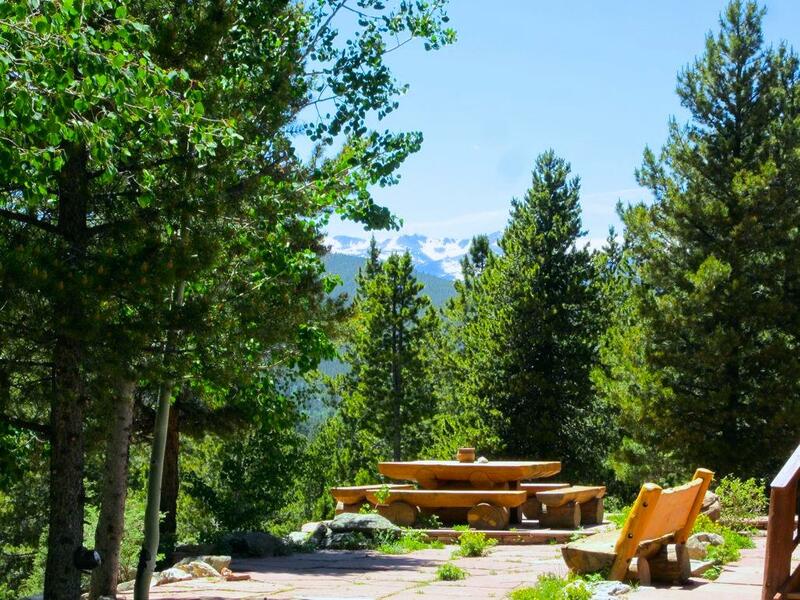 The views and the forest are amazing! 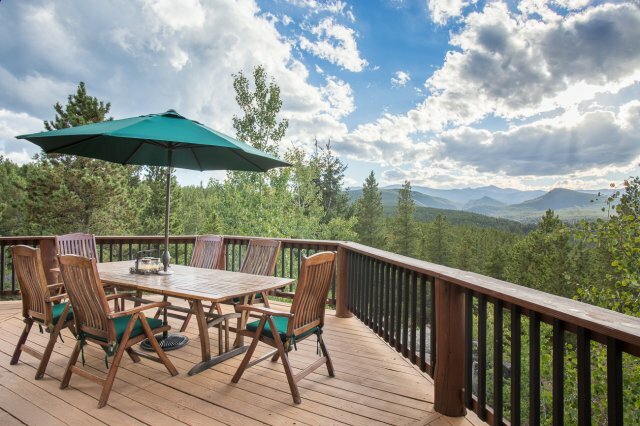 The dining deck outside has jaw dropping views and features the sought after GREEN EGG BBQ. The dining deck has service for 6 but can squeeze 8 to 10. 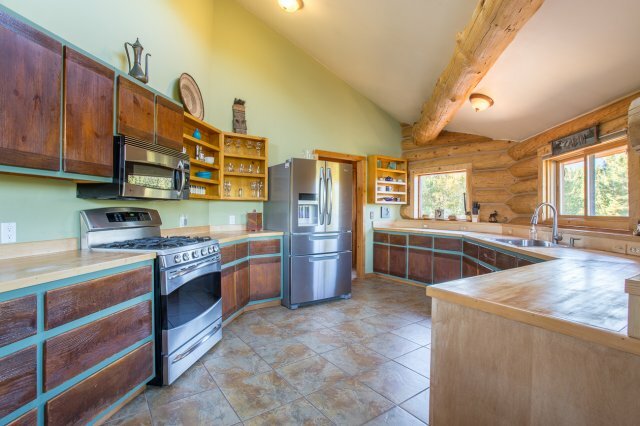 With Stainless appliances & butcher block counter tops, the kitchen is fully equipped with flat ware, dishware, pots, pans, coffee maker, toaster, microwave, double sinks, and all the implements to cook a gourmet meal. An additional walk-in pantry houses anything else you may need including BBQ implements, outdoor dishware, spices, cookbooks, etc. Dining area inside has service for 6 but can squeeze 8. 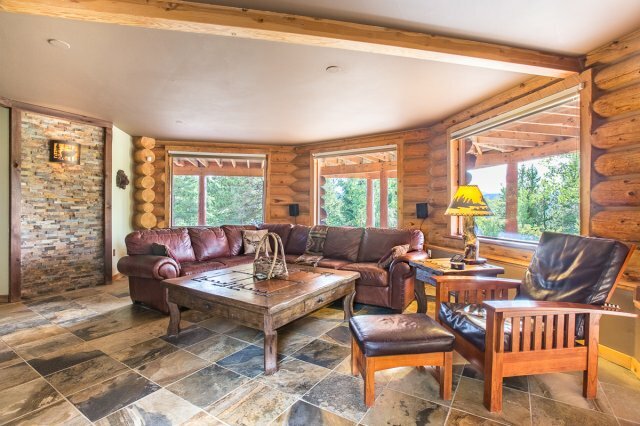 Two Huge picture windows feature stunning mountain views and a slider takes you out to the dining deck seating 6 & squeezing 8, comfortably seating on a nice day 12 to 14. For holiday dinners in winter months, there's an additional 4 top table that can be moved to the dining area comfortably seating 10 -12. The bottom floor features a wet bar, mini fridge, and comfy theater with 65 inch Flat screen LED Smart TV, DVD library, CD library, Wii Gaming console with games, HDMI patch for presentations and surround sound. The entertainment system not only plays music in the theater, but outside on our entertainment decks. 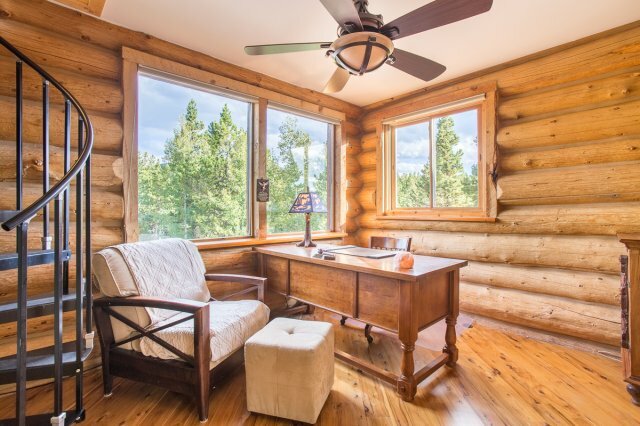 An accommodating study includes a phone with free local and long distance calling. Wifi is also available throughout the home. Just bring the laptop or iPad.